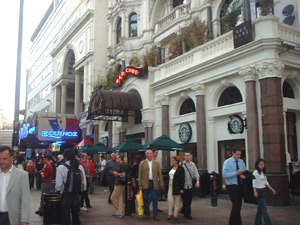 We were glad to be informed that a brand spanking new Starbucks restaurant was due to open in Leicester Sq. Glad ,not of course because it meant that the evil empire was spreading even further, but rather glad that we had been informed enough to get down to welcome them in our own special way. As 6 o'clock struck the store opened and all of the local businesses were invited down for free coffee. We unfortunately were not invited but I guess that was just a mistake. With Ed dressed as a general Starbucks hating member of the public and my self as a spoof caricature of a Starbucks employee from hell, we burst into Leicester Sq sprinting at full speed through the crowds. 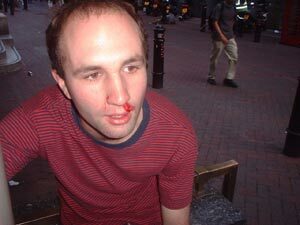 Ed had blood running down from his nose and was screaming about how evil Starbucks are. I was chasing him screaming that it was scum like him that stopped us from taking over the world. We chased around the square for a while before Ed sprinted towards the new store, shouting all the time. 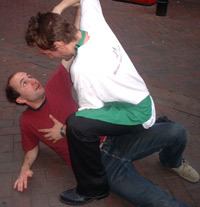 I managed to conveniently catch him outside the front, where we fell to the floor and I started to hit and slap him. Ed screamed and kicked me off, only for our chase to begin again around the square. Poor old Starbucks nobody likes them. Incidentally this story has since appeared in the New Statesman Magazine in an article written by Johann Hari. ""You piece of commie s**t! You f***ing anti-globalisation scum! Why don't you go back to f***ing Soviet Russia!" Slipping a few of your own views on the anti-capitalist movement in there are we Johann? And I always trusted what the media said.